When life gives you chutney, you better find ways to serve it up. I made these for Thanksgiving starters to sate the guests till the turkey was ready! I had two Thanksgivings: this was a bacon Parmesan johnny cake the first day, but they were just okay, so I whipped these up and they were stunning! Mix potato and onion together and sprinkle with two teaspoons of salt and set aside. Cook bacon until almost crisp and drain. Drain excess liquid from the potato mixture. Add bacon, egg and pepper to bowl. Slowly add enough flour to give mixture enough body to hold together. Heat 1/2” of canola oil in a skillet to medium heat. [At this point I test the mixture to make sure it has enough salt, by cooking a sample cake ... and then another and another, until I get it right ] Spoon teaspoons of potato mixture in the pan and be sure to flatten them out a little so you have a surface to put the chutney on. Brown on one side (about 5 minutes) and then brown on the other. Drain on paper towels. 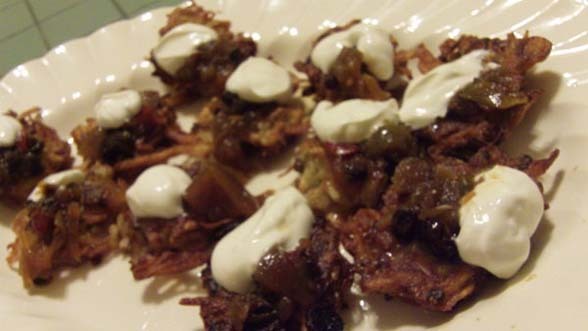 Top with your favorite chutney or a dollop of sweet chili sauce and sour cream.